Frostie root beer is dark in color. It produces a head that dissipates very quickly. The root beer is not creamy or over carbonated. Like many of the root beers that are sweetened with pure cane sugar, the other ingredients are easy to taste. This is an interesting root beer that is best enjoyed alone, instead of with a meal. 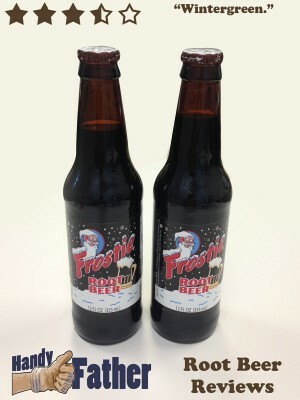 Frostie root beer has been made since 1939. Ingredients: Carbonated water, pure cane sugar, caramel color, sodium benzoate (a preservative), citric acid, natural and artificial flavors. Frostie Root Beer Review score: 3.5 stars out of 5. Do you have your own Frostie root beer review? Link to it in the comments below. If you’re eager to try Frostie Root Beer , go ahead and get some! We recommend it at least once. Then let us know what you think of Frostie Root Beer .